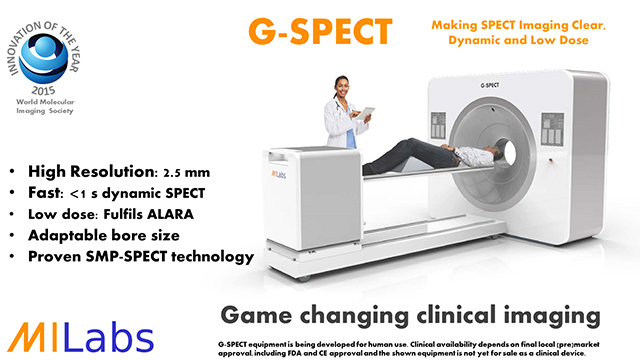 G-SPECT is a highly advanced high performance full-ring SPECT system being developed for clinical use. 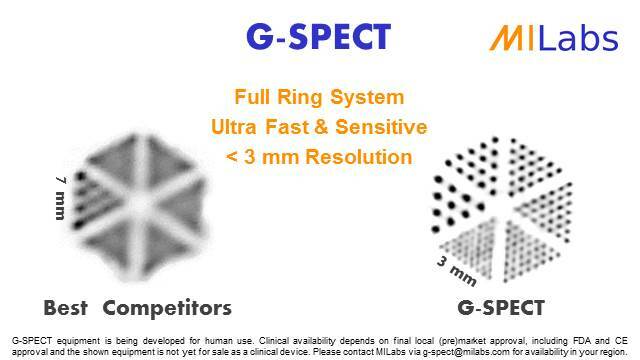 G-SPECT has <3 mm isotropic resolution, and is suitable for imaging a wide range of isotopes including 99mTc, 111In and 123I. With its unique potential for both high resolution and extremely fast dynamic imaging, groundbreaking applications are expected in brain, bone and pediatric imaging. A high resolution cardiac option with a larger bore collimator is being developed as well. G-SPECT equipment is being developed for human use. Clinical availability depends on final local (pre)market approval, including FDA and CE approval and the shown equipment is not yet for sale as a clinical device.